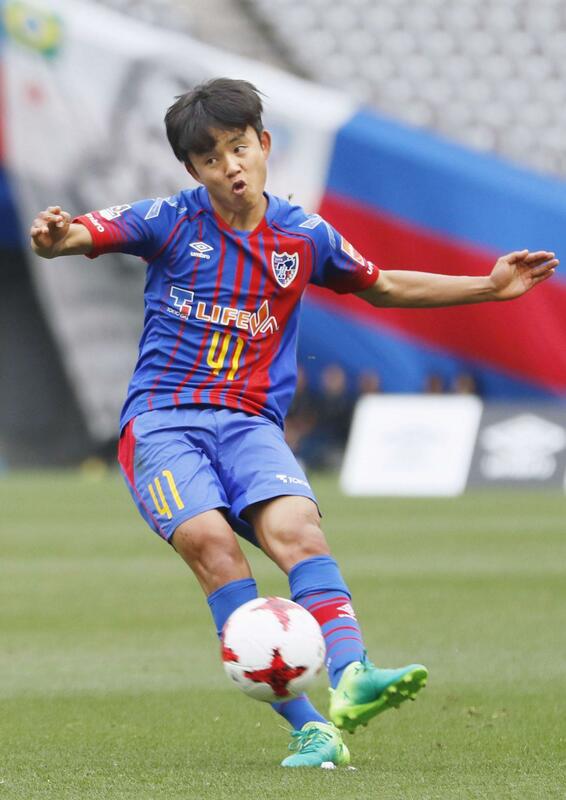 Former Barcelona wunderkind Takefusa Kubo made his top-team debut for FC Tokyo in a 1-0 win over Consadole Sapporo in the Levain Cup on Wednesday, becoming the second-youngest player to appear in J. League’s first division competition. At 15 years, 10 months and 30 days, Kubo is behind only former Japan forward Takayuki Morimoto, who debuted at 15 years, 10 months and six days back in 2004. Across the three divisions in the J. League, Kubo debuted for Tokyo’s under-23s in J3 in November at a record 15 years, five months and one day. While Tokyo claimed an important three points in its league cup campaign — improving to third in Group A, three points off the pace of Vegalta Sendai with a game in hand — the result was a sideshow to one of the most highly anticipated debuts the league has seen. “Playing today reminded me just how competitive the J. League is,” Kubo said. “Finally, I’ve taken my first step. Compared to J3, they play a lot more off on one touch here. “When I arrived at the stadium, I could hear so many of the fans and was a little bit nervous, but once I was on the pitch I couldn’t afford to be nervous. I had to go out and do it. 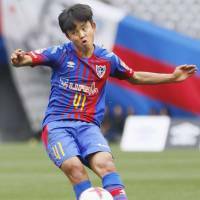 The left-footed midfielder — selected a day earlier to the Japan national team for the Under-20 World Cup in South Korea — came off the bench six minutes past the hour for Kensuke Nagai, who scored the game’s only goal in the 31st minute. Kubo, who showed composure far beyond his years in his cameo of around 30 minutes, received a rousing ovation from the crowd of 19,123 at Ajinomoto Stadium as he came on. He won a free kick just outside the box in the 84th minute, but curled into the side netting. Sapporo’s three-time World Cup midfielder Shinji Ono, a 37-year-old who was once a teenage phenom himself, said Kubo is far more advanced than he was at the age of 15. “There’s no comparing him and me at this age. He’s incredible,” said Ono, arguably Japan’s most naturally talented player of alltime. “I’m sure he was just trying to fit in today, but the fact that they let him take the free kick says a lot about how much respect he already has from his teammates. Kubo, who wasn’t even born when Ono made his professional debut with Urawa Reds in 1998, was a giddy teenager when told about the chorus of praise from Ono. “It’s an honor he said that,” Kubo said. “I’ve watched his performances on Youtube but like his volley in their last Levain Cup match, he’s quality. When he traps, the ball sticks to his feet. “He’s played in World Cups, he’s got an aura about him and is so talented. It was a great experience for me. Tokyo coach Yoshiyuki Shinoda said Kubo was fit enough to start, but did not want to throw him in the deep end right away, choosing to ease him in slowly but surely. “He’s talented enough that he could have gone from the start of the second half — or the game, even. He’s got the ability,” Shinoda said. “But he hasn’t spent much time with the top team so for him and for the club, he played about the right amount of time for today. In other league cup action, Sendai surfaced at the top of Group A with a 2-1 win away to Omiya Ardija and Jubilo Iwata beat Reysol 2-1 in Kashiwa to move up to fourth. In Group B, Vissel Kobe, with a game in hand, held on to first place with a 1-0 home win over Sagan Tosu. Cerezo Osaka defeated Sanfrecce Hiroshima 1-0 away while Yokohama F Marinos beat Ventforet by the same scoreline in Kofu.